Fr. Cole Kracke’s birth mother, Sally Shadrick, died in a car accident when he was three years old. She was 21 at the time and she and his birth father never married. He was raised by his maternal family and grew up on Biscayne Avenue in Farmington until he was 10 years old. The next couple of years, he lived with relatives and foster homes in Shoreview, Apple Valley and Burnsville. He graduated from Burnsville High School in 1992 and entered the U.S. Navy as a Cryptologic Technician. His first duty station after initial training was at the Naval Computer and Telecommunication Station in Rota, Spain. He lived there for 2 years and it was there in 1994 that he entered the Catholic Church during the Easter Vigil. After Spain, he moved to the West Coast, where he was stationed at the Strike Fighter Weapons School/Strike Intelligence Center located in Lemoore, California. Less than two years later, he volunteered for sea duty and was transferred to the Pre-Commissioning Unit of USS Bataan (LHD 5) which was under construction in Pascagoula, Mississippi. After 3½ years home-ported out of Norfolk, Virginia, he moved back to the West Coast and was assigned to the Northwest Regional Naval Intelligence Command. It was in Whidbey Island, Washington, that he was selected for commissioning as a Naval Officer. He returned to Norfolk to complete his Bachelors Degree at Old Dominion University. In May 2003, he was commissioned and took orders to a newly built guided missile destroyer named the USS Mason (DDG 87). His billet was the Safety Officer and CIC Division Officer. Shortly after completing all of his Surface Warfare qualifications, he was diagnosed with Type 1 Juvenile Diabetes. This hastened his early exit from his Naval career. Priesthood was nothing he seriously considered until he felt his calling affirmed through the death of Pope John Paul II and his inspiring life of sacrifice. His first two years of seminary were with the Diocese of Richmond, Virginia, where he attended St Mary’s Seminary and University in Baltimore. After two years, he felt the Holy Spirit calling him to return to Minnesota. 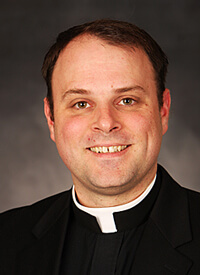 After three additional years of study at St. Paul Seminary, he graduated with a Master’s of Divinity and was ordained a Priest on May 28, 2011. His initial assignment was as Parochial Vicar at St. Elizabeth Ann Seton Parish in Hastings. His assignment there lasted four years and on Good Friday of 2015, he was asked to come to this parish community.